Now that Labor Day has passed, I’m sure you’ve all packed up those white pants, cleared away those grills, and said goodbye to summer. If you’re anything like us, you actually haven’t… are holding onto summer for dear life… might be having trouble welcoming cooler weather and transitioning into fall. Luckily, we’ve got you covered with this tasty side dish that’ll get you excited for the new season. Toasted quinoa, tear drop tomatoes, and an arsenal of herbs come together to create a refreshing dish reminiscent of summer! 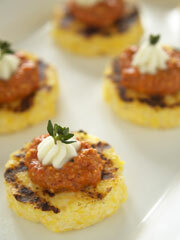 This recipe can also be found in our section of Side Dishes! 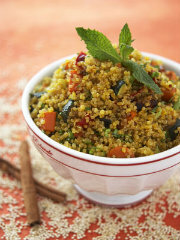 Wash Quinoa: Place quinoa into a fine-mesh strainer and rinse under cold water, about 1-2 minutes. Shake briskly to remove excess water. (If you don’t rinse, quinoa will be very bitter). Bring the water up to a boil in a sauce pan. Toast Quinoa: In a large high sided sauté pan or a Dutch oven that has a lid, dry roast the washed quinoa over medium high heat. Stir constantly until it gives off a nutty aroma and all of the water from washing evaporates, about 5 minutes. Cook Quinoa: Pour the boiling water over the quinoa and stir in the olive oil and salt. Bring back up to a boil, reduce heat to low, cover, and let cook for 15 minutes. After 15 minutes, remove the lid, stir and let the quinoa dry out for 2-3 minutes more. The germ around the grain should be very apparent. Toast Pepitas: Toast the pepitas in a dry sauté pan over medium heat until they brown and pop, about 3 minutes. Prepare Ingredients: Chop the scallions and remove the very end of the cilantro stems. Peel and smash the garlic and juice the lime. Make Pesto: Place all of the pesto ingredients, except the olive oil, into the bowl of a food processor. Turn processor on and slowly add the olive oil. Scrape the sides of bowl and process again. Taste and re season if necessary. Set aside for use later. Halve Tomatoes: Cut the tomatoes in half (or quarters if large) and place into a small bowl. Mince the garlic and chop the cilantro, add to the tomatoes. Stir in the lime juice, olive oil, salt and pepper. Dress Quinoa: Add the pesto into the quinoa and incorporate well. Gently mix in the tomatoes. Serve quinoa warm or at room temperature, garnished with the grated cheese and lime wedges.